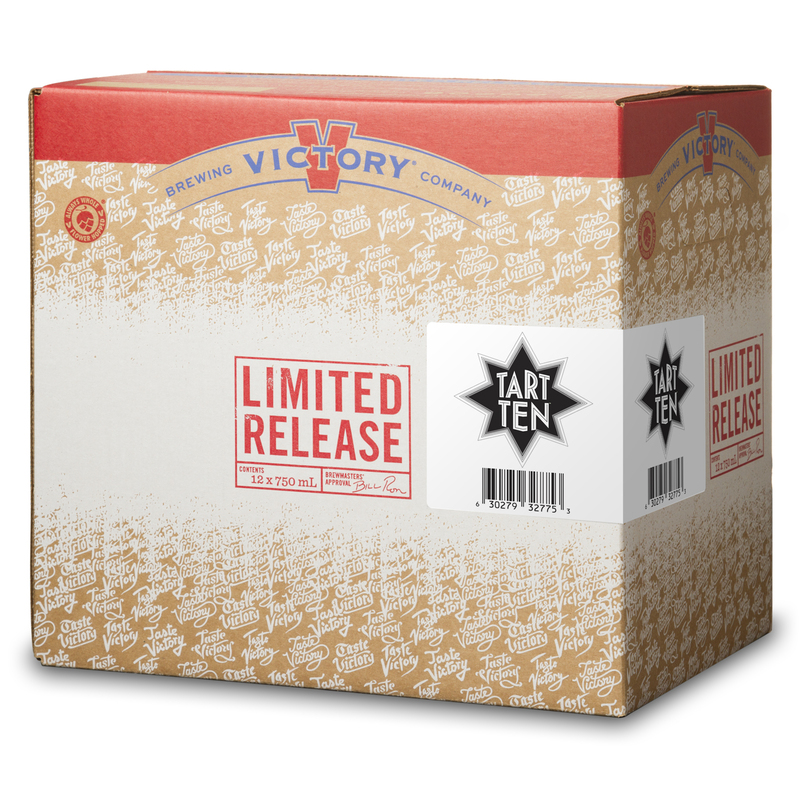 Downingtown, PA, - Victory Brewing Company (Victory) introduces its newest seasonal, Tart Ten, a strong, refreshingly zingy, tart-tingly Belgian Dubbel ale fermented with Brettanomyces. 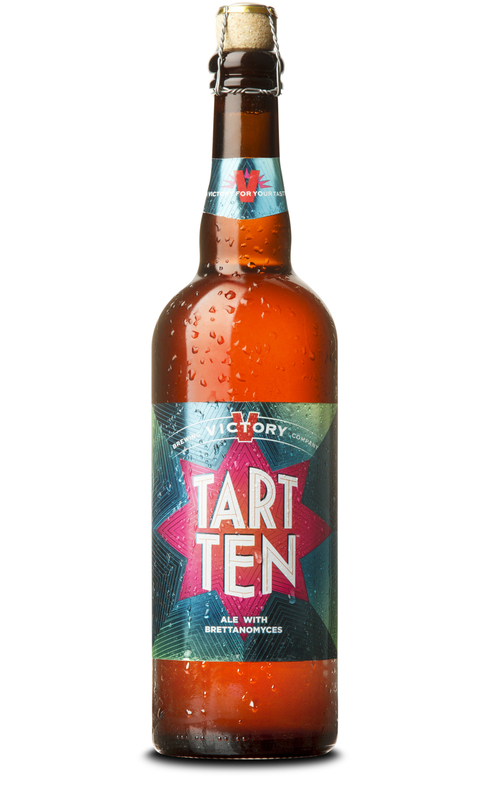 Respecting European tradition and Belgium’s vast history of brewing and beer styles, Victory's brewmasters applied their signature American ingenuity and creativity, marrying these influences in Tart Ten, which is rich in flavor but light in body. It is currently available nationally throughout Victory’s 37-state footprint. A harmonious composition of Pilsner and Caramel Malts and Czech Saaz hops fermented with non spore-forming Brettanomyces yeast, the bold ale commands presence by taking the palate on a complex journey of the senses with an initial acidic impression followed by a pleasantly smooth finish. At 10% ABV, Tart Ten brings the all the delicious and unpredictable wild funk to the table that every great party is known for. Bottled in a celebratory cork and cage 750 ml bottle its suggested retail price is $9.99 depending on location, and is also available on draft. Naturally occurring in the wooden fermenters of old, Brettanomyces was commonly found in Belgian ales, saisons and lambics prior to sanitation processes and stainless steel vessel fermentation, which modernized brewing starting in the late 19th century. However, Brettanomyces has increasingly captured the imaginations of a growing number of brewers and aficionados due to its complex ability to showcase the true artistry and compelling depth of flavors that increasingly defines the craft beer industry. Use Victory’s Beerfinder to discover a nearby location where Tart Ten is available, or download the free Victory Mobile app for Android or iPhone. Victory Brewing Company is a craft brewery headquartered in Downingtown, PA. Founded by childhood friends, Bill Covaleski and Ron Barchet, Victory officially opened its doors in February of 1996. Victory’s second state of the art brewery opened in February of 2014 in Parkesburg, PA to serve fans of fully flavored beers in 37 states with innovative beers melding European ingredients and technology with American creativity. Victory operates three brewpubs; the original Downingtown site, Victory at Magnolia in Kennett Square and Parkesburg featuring self-guided tours. Victory recently announced an alliance with Southern Tier Brewing under the parent company of Artisanal Brewing Ventures. To learn more about Victory Brewing Company please visit www.victorybeer.com. No-Li Brewhouse Wins Large Brewery of the Year!